Google Home smart devices are pretty smart most of the time, but that might not feel so true when it under-performs. Sometimes it's a Wi-Fi issue, a microphone that doesn’t hear you, speakers that don’t deliver clear sound, or connected devices that don’t communicate with the Google Home. Regardless of how Google Home isn’t working, there’s most likely a pretty simple explanation and an easy fix to get things working again. No matter what problem you’re having with Google Home, the first thing you should try is restarting it. You’ve probably heard that restarting is great for other technology when it isn't working correctly and the same advice holds true for the Google Home, too. Download Google Home from Google Play for Android or via the App Store for iPhones. Tap the menu button at the top right corner of the app. Find the Google Home device from the list of devices and tap the small menu to the top right. If rebooting through the software doesn’t fix the problem you’re having, unplug the power cord from the back of the Google Home and let it sit like that, unplugged, for 60 seconds. Plug the cord back in and wait another minute for it to fully power on, and then check to see if the problem goes away. The Google Home works well only when it has a valid network connection. 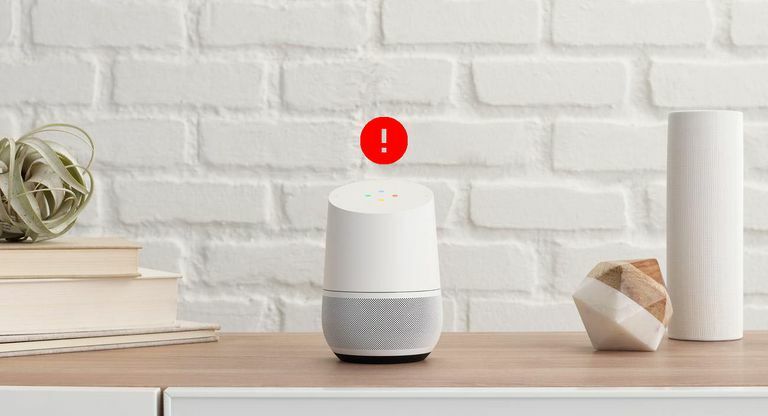 Problems with Google Home connecting to Wi-Fi and Bluetooth can cause lots of issues, like spotty internet connections, buffering, music that suddenly stops out of nowhere, and more. See What to Do When Google Home Won’t Connect to Wi-Fi for an in-depth look at what the connection problem could be, and what to do about it. The most likely reason for why Google Home doesn’t respond when you talk to it is because you’re not talking loud enough. Move closer to it or permanently place it somewhere it can more easily hear you. If you’ve done this and your Google Home still isn’t responding, check the volume level; it's possible it does hear you just fine but you can't hear it! You can turn the volume up on your Google Home by swiping in a clockwise motion on the top, or by tapping the right side of the Mini, or by sliding to the right on the front of your Google Home Max. If you still can’t hear anything from Google Home, the mic might be completely disabled. There’s an on/off switch on the back of the speaker that controls whether the microphone is enabled or disabled. You should see a yellow or orange light if the mic is turned off. Is the mic on but you hear static? Try to factory reset Google Home to restore all its settings back to the way they were when you first bought it. In an opposite situation, your Google Home might speak up too often! There isn’t much you can do about this since the cause might just be a simple misinterpretation of what it hears from you, the TV, a radio, etc. The trigger phrase to have Google Home listen can be “Ok Google” or “Hey Google,” so saying something like that in conversation can be enough to start it up. In some cases, Google Home might activate when it’s moved, so keeping it on a sturdy, flat surface should help. Another common Google Home problem is poor music playback, and there are multiple reasons it could happen. What you might see when Google Home is having troubles with music is songs that start but then stop occasionally, or even at the same point during the same song. Other problems include music that takes forever to load after you tell Google Home to play it, or music that stops playing hours later for no apparent reason. See What to Do When Google Home Stops Playing Music for all the steps you should walk through to fix the problem. If the Google Home has the wrong location set up, you’ll definitely get some strange results when you ask about the current weather conditions, request traffic updates, want distance information from where you are, etc. While on the same network as your Google Home, open the Google Home app. Open the menu at the top left corner. Make sure the account you see is the same one connected to the Google Home device. If it isn’t, tap the triangle next to the email address and switch to the correct account. In the list of devices, tap the Google Home and then choose Device address. Enter the correct address in the space provided, and tap OK to save the changes. From the menu, go to More settings > Personal info > Home and work locations. Type in the appropriate address for your home and work, or tap the existing one to edit it. Any other issue at this point should be directed toward Google. You can contact the Google Home support team to have them call you, or use the chat option to instant message or email someone from the support team. See How to Talk to Tech Support for a general guideline on what you need to know before contacting Google and how to best handle the call.